St. Patrick used a shamrock to explain the mystery of the Most Holy Trinity. Others have used the example of the family. Father's homily this morning touched on St. Anselm of Canterbury who compared the Trinity to a spring, a stream and a lake and St. Bonaventure who applied St. Augustine's three powers of the soul (memory, intellect and will) to the processions of the Holy Trinity. As a representation of the Most Holy Trinity, we made Trinity Cookies. 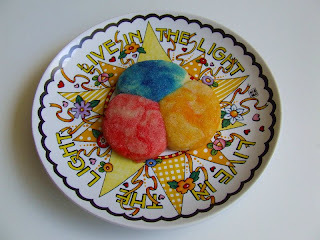 I had some left over cookie dough from the Stained Glass Tulip cookies that never got made on Sunshine's birthday (we just plain ran out of time) so I divided it into three parts and colored them accordingly: red for God the Holy Spirit, gold for God the Son (it's a kingly color), and blue for God the Father who made heaven and earth. 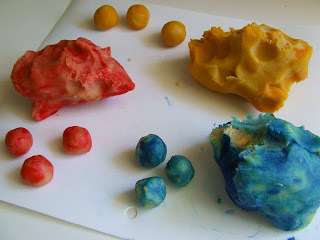 The kids enjoyed rolling them into balls and placing them on the cookie sheet. 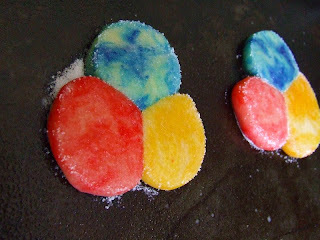 We flattened them slightly with a sugared glass bottom so they would cook evenly. And, in the interest of full disclosure, I will reveal to you that at no time during the shaping and baking did we notice that the cookie dough smelled... a little rancid.... They looked so pretty! But when we removed them from the oven, the smell was faint but unmistakable.Ugh! God is like... a rainbow sherbet! Russian Catholics favor a wedding band made of three interlocking rings. The rings, representing the Trinity, can be made of metals of three different colors or all of the same precious metal for a more uniform look. The cookies look pretty anyway. The rings look like a neat representation of marriage. I love the wedding band! Our dessert, ( I failed to photograph it) was a trio of an ice cream sundae.. three in one.. ice cream, strawberries, and whipped cream... I love your cookie idea.. tucking it away for next year. Wonderful post, wonderful ideas, as always, Charlotte. 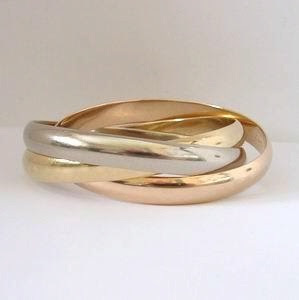 But, I especially loved seeing the wedding band -- I've never heard of this custom; I'm so glad you shared that. Very cool.